Studio 5380: Happy Birthday Donell! Hello everyone and thanks for stopping by today! Today is a special day around my house - it is my sweet hubby's birthday! I never know what to buy for him on his birthday (or Christmas or Father's Day or our Anniversary) because he just never asks for anything. And if I ask him what he would like, I usually just get a "I really don't need anything". Guess I ask for enough for the both of us! 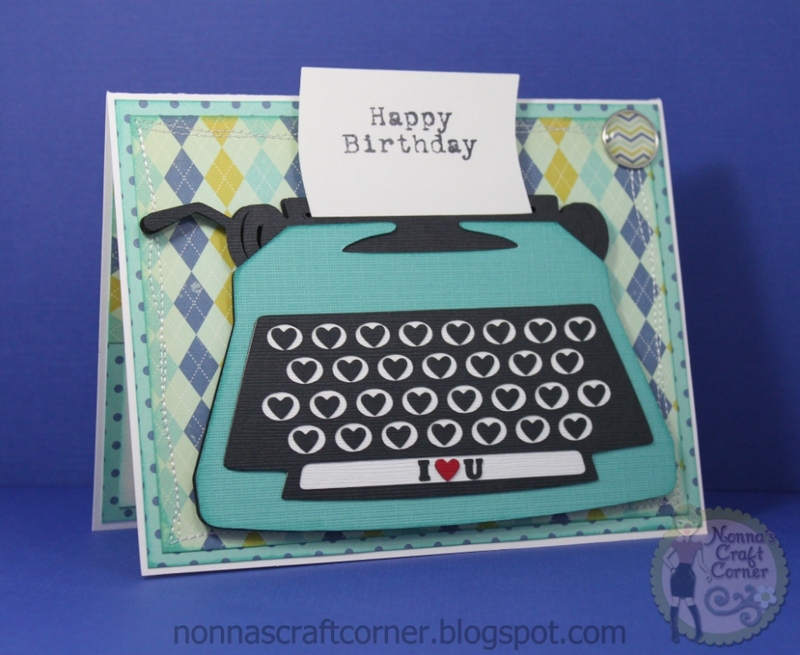 *Paper - October Afternoon - "9 To 5"
* Sentiment - Pink By Design "Vintage Greetings"
The typewriter file comes with blank keys. After I put the card together, it just looked like something was missing (duh...the letters). I thought about stamping letters or cutting out letters, but the keys are just too small. After looking at it for awhile, I realized that would not work anyway because the number of keys is incorrect. I was really beginning to give up and started taking photos deciding to leave it the way it was. Then...ta da...it hit me...tiny little hearts! And, I had the perfect Martha Stewart punch on hand.... I love the way it turned out! I did cut out the letters I and U for the space bar. And for a punch of color, I used a red heart. 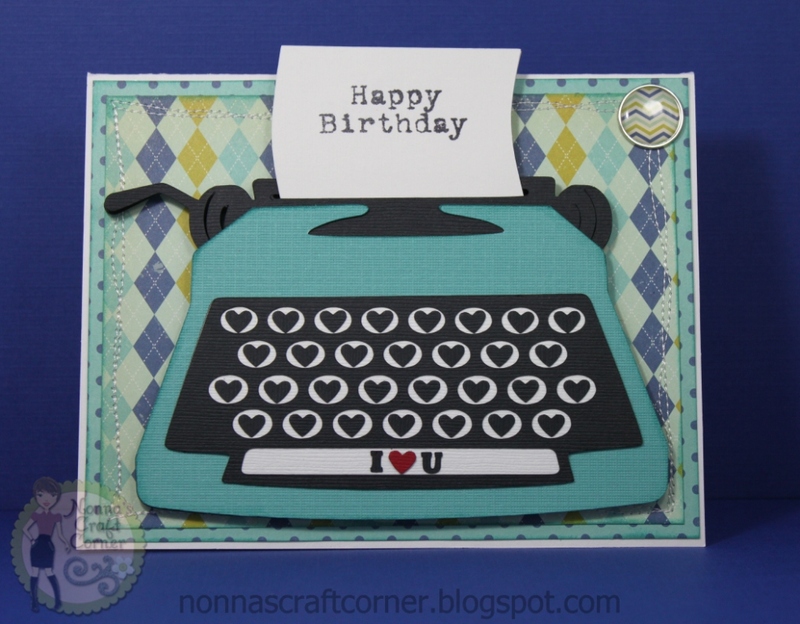 And, there you go - a birthday card for my hubby! Thanks again for stopping by today! Happy Birthday Donell - I love you! Great card!! I love it! The hearts on the keys are just perfect. My hubby tells me the same thing when I ask him what he wants!! I love, love, love your b-day creation... It's darling. Happy b-day to your hubby. Beautiful card Tanya! I love it! He will love it too! What a great card Tanya! 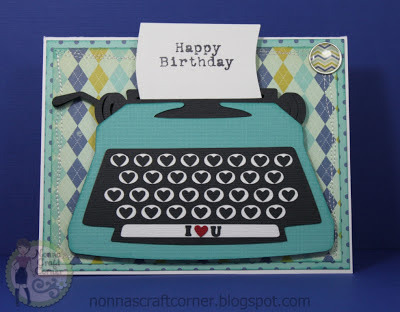 I thought the hearts were cut out with the typewriter. You are so resourceful! Happy Birthday to Donell! And Tanya be careful with your sweet Lola! Hope your finger heals fast and don't hurt too much. such a CUTE card Tanya!! What a great card for your DH!! My hubby keeps all the cards I make him and that makes me happy, too!! Love this and the color of paper you used. Happy Birthday to Hubby. Tanya ~ Well you kow how I ADORE EVERY THING you create but this story just touched my heart! That is a good man you have and I know he has a FABULOUS, TALENTED and WONDERFUL woman( note how many adjectives I gave you ~ hehehe)!! Happy Birthdya to your hubby! I hope he enjoys his special day! Plus I think I saw somwhere on your FB page ~ you got stitches!! PLEASE take care!! Poor thing! Plus what will I do if you can't craft????? Oh this card is just fabulous. I love the keys! How sweet of hubby to show so publically how much he appreciates your craft. What a Beautiful card!Very Sweet!LOVE the heart! Wonderful! !Happy Bday to your husband! Happy Birthday to your hubby!!! Awesome card Tonya! Sorry to hear about your finger :( Saw that on FB! bummer:( Thinking of you-hope it heals quickly! That did come out super cute, Tanya. LOL at your post about the gift. Super sweet that your hubby saves all your cards. I stopped making them for mine when he put the last one I made him down after a 3 second glance so he could get back to what he was working on with his computer. Grrr....now he's a bit remorseful, but I ain't over it yet. ;) Hugs, my scrappy friend. Thanks for the inspiration as always. What a cute card! I love that your hubby keeps all your cards, how sweet is that!!! Tanya, this is an adorable card. He's going to love it. My hubby saves my cards too.